William Augustus, Duke of Cumberland (1721-1765), General; third son of George II. Sitter associated with 45 portraits. William Augustus was King George II's second surviving son and his parent's favourite. Although only seven, he is shown here as a miniature adult wearing the red and ermine robes of state, his recently awarded Order of the Bath, and holding his crown. 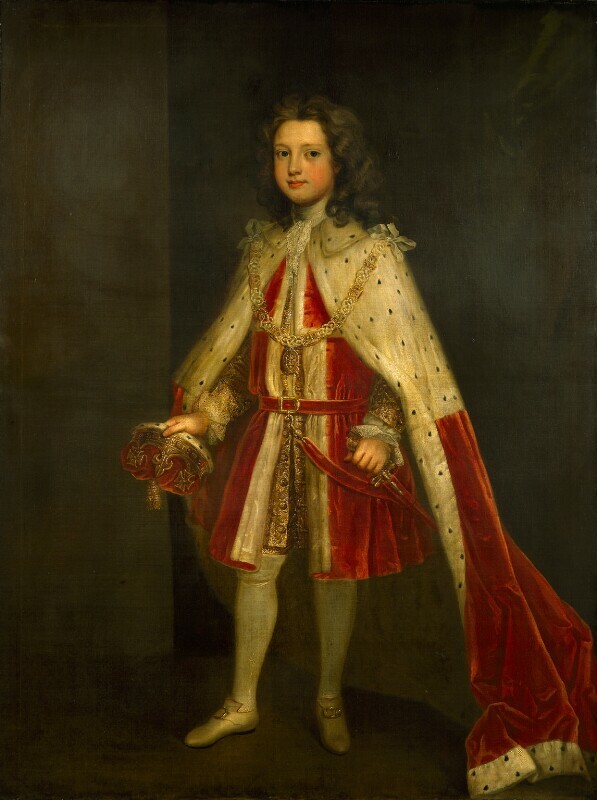 In this ceremonial portrait, his identity is not that of an individual child but of a state official - the Duke of Cumberland and first Knight of the Bath. Nevertheless, his tender years show through in his plump cheeks and slightly nervous expression. More detailed information on this portrait is available in a National Portrait Gallery collection catalogue, John Kerslake's Early Georgian Portraits (1977, out of print). George II's son Frederick, soon to be Prince of Wales, arrives in Britain for the first time, aged 21. Satirist Jonathan Swift publishes A Short View on the State of Ireland which severely criticises British policy in Ireland. Composer George Frideric Handel is appointed director of the King's Theatre, London. John Gay's The Beggar's Opera debuts at the Lincoln's Inn Fields Theatre, London. First version of Alexander Pope's landmark literary satire The Dunciad is published. Astronomer James Bradley uses stellar aberration to calculate the speed of light and observes the nutation of the Earth's axis. British troops under Sir Charles Wager remain steadfast in Gibraltar and Spain ends its siege. Convention of Prado ends the one-year war between Britain and Spain. Danish explorer Vitus Bering sails into Arctic seas through the strait between Asia and America now known by his name.